Every year, Wu Hung returns to Beijing for the summer months. China’s capital city is his place of birth; while there, he visits family, mingles with old friends, and champions the nation’s contemporary art scene. By now the world knows that whatever China does, it does on a massive scale. The arts are not exempt; “the magnitude is difficult to imagine,” says Wu Hung of the boom in galleries and art centers. He characterizes Beijing’s art production as ten times that of SoHo or Chelsea. The analogy to New York City is apt if the market is your indicator. Yet, as an intellectual—Wu Hung is a Harvard-schooled art historian, curator and professor—he does not look solely to China’s economic successes to chart art’s accomplishments. Anyway, everyone already knows how that story goes. While it’s easy to get hung up on record auction sales and power collectors, Wu Hung hopes that he can expose Western audiences to a deeper understanding of Chinese culture. As a professor of Chinese art history at the University of Chicago and the director of the Center for the Art of East Asia, Wu Hung is a devout academic and scholar. He has fashioned his curatorial career, though, as a cultural diplomat. He’s been curating exhibitions since the 1980s, but his breakthrough exhibition in Chicago was 2004’s “Between Past and Future: New Photography and Video from China,” a mammoth show of new media art that filled galleries at both the Smart Museum and the Museum of Contemporary Art, and toured to several other cities. The exhibition introduced Western audiences to the Chinese avant-garde that, in many ways, resembled established Western contemporary art practices. Familiar tactics included durational performance art, buzzwords such as “the abject body” and experimentation with video as a medium. These and other conceptual practices are already canonized in American and European art from the sixties through the nineties. It’s not that China is a nation of Nam June Paik revivalists; rather, the neon god, smokestacks spewing pop culture and a government hell-bent on modernization—not to mention the newfound possibility for dissention and critique—produced counter-cultural responses that paralleled the Western approach. Wu Hung’s survey showed us that China is ready to join the dialogue in a serious way. “Displacement,” like many temporary exhibitions, is the product of several years’ worth of research, writing, travels to artist studios and coordination with other curators and institutions. While summering in Beijing, though, Wu Hung is able to curate three-to-four shows in a single season. “There’s a different speed of life,” he says. Discrepancies in the sensation of time passing are everywhere apparent in a nation riding hard on industrial and corporate progress while simultaneously carrying the weight of millennia-old heritage. The project to dam China’s Yangtze River, which will provide up to ten percent of China’s citizens with clean energy, has been in conception for at least eighty years, yet residents living on the river’s banks witnessed the newly constructed reservoir swell one foot every two hours, dividing the past and the present by a sheet of water. The controlled flooding of the 1,400 villages and towns along the Yangtze this time was, at least, the good type of flooding, that is, it was planned and controlled. These towns had been susceptible to horrendous natural floods for as long as people called the Yangtze and its valleys home. Torrential flooding kills people by the thousands each time: 1911, 1931, 1935, 1954 and it is said that 1998’s flood was on par with the damage wrought by Hurricane Katrina. The Three Gorges Dam, which will finally cease natural flooding in the area, comes as a great boon to the region’s population, even if it means that more than one million people have had to resettle their lives in government-built cities up the mountainside. The flooding of the river valley has been so persistent, and its toll on life so profound, that the very idea of rushing water is a staple in Chinese mythology. Flooding, similar to the Noah story, carries with it all the associations of creation bound up with destruction—that if the world is washed away, a clean slate brings a chance for renewal, spiritual or otherwise. Such an ancient, epic and ultimately tragic tale is recorded in a recently published book, “The Flood Myths of Early China” by Mark Edward Lewis, and in fascinatingly recondite essays such as Qiguang Zhao’s “Chinese Mythology in the Context of Hydraulic Society.” One need only visit “Displacement,” though, to get a sense of how floods permeate the cultural and historical psyche of the riverbank’s inhabitants. Wu Hung accentuates the four contemporary artistic perspectives by including two scroll paintings, both painted hundreds of years ago, and both depicting man’s struggle with the river. One scroll, painted by an unknown artist from the Ming Dynasty (1368-1644), records the story of Yu, who won China’s throne by ably controlling the legendary flood. The King Yu myth comes from the Xia Dynasty, 2070-1600 BCE—an incomprehensibly long time ago. Yu’s ancient story of saving the villagers by controlling the flood couldn’t be more relevant to present government intervention; Yu moved a mountain, and today, the largest dam in the world is being built. The 4,000-year-old myth and the five-year-old dam are both manifestations of “good government,” the workings of authoritarian government in the service of the peoples’ happiness. As Wu Hung sees it, the artist reactions in “Displacement” are also political—simply by way of participation. I asked Wu Hung if contemporary Chinese artists were responding to the environmental crises, just as many American artists are, say, in the vein of the 2005 exhibition held at the Smart Museum, “Beyond Green: Toward a Sustainable Art,” and especially since coal-burning power plants are being built at ten times the rate (or more) as clean energy dams. He replied that no, Chinese artists aren’t ready to take on these issues, but an oil painter such as Liu Xiaodong, who made three gigantic canvases at the site of the dam project, just wanted to be there; that was his way of responding politically. Wu Hung admits that it’s “hard to call it political art,” but the artist’s involvement might make it so. While the resettled communities are giving up a lot—their native homes, their land, their way of life—and suffering a bit for the good of the whole, neither Wu Hung nor the four artists in the show seem to be passing judgment on the project. The hardships of resettlement, labor and loss—all the human elements—are represented through an even-handed approach. It’s well-documented that the displaced residents, having lost their old way of life, but gaining modern dwellings, and many living with running water for the first time, widely accept the building of the dam as beneficial to the whole. The four artists in the exhibition selected by Wu Hung all approach their art with a strong narrative arc, and all make art on a monumental scale, just like the dam. It’s epic art for a massive engineering project. In a way, this is a comfortable sort of packaging. Those familiar with Chinese art know well the long scroll paintings with stories that develop as the viewer moves across its surface. Yun-Fei Ji’s “Water Rising,” from 2006, uses this traditional format to tell the contemporary story of residents packing up their homes and moving. Painted with inks on paper, the work could very well be of the same class as the antique scrolls just around the gallery’s corner, except, of course, for the minivans and bicycles. 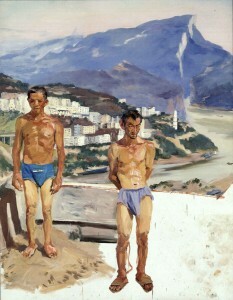 Liu Xiaodong’s oil painting is also approachable. His popular realist style may be the reason for his status as one of China’s most well-respected and highly praised painters. Realistic portraiture, once a propagandistic tool, is now widely used to portray daily life, and its popularity remains high despite, or perhaps because of, edgier, more conceptual practices that cater to underground or intellectual audiences. The five-panel canvas “Hotbed,” from 2005, shows the dam’s laborers resting outdoors on discarded furniture atop a roof. Behind them stretches the picturesque steppes of the Gorges and the construction of the dam. The nine-by-thirty-three foot painting is huge considering that Liu Xiaodong painted it on site. It is somewhat of an epiphany, though, to realize that the figures in the painting are scaled to roughly life-size, so our view is, again, one of realistic access into the scene. Liu Xiaodong chose to leave the bottom left corner of his painting unfinished, with only roughly sketched lines demarcating where the dam is being built. This corner of space hangs suspended between construction and destruction, between something taking shape and another thing falling to ruin. So, too, do we get this sense of in-between-ness in Chen Qiulin’s video art. In the four works that Wu Hung has configured into a narrative cycle about the destruction of the artist’s hometown and, later, her family’s movement into the new cities, sometimes it’s difficult to tell whether a structure is being built or if it is being torn down. In one scene, workers struggle to raise a building’s wooden frame, and when they slip, it comes crashing down. As if a primer on Eastern philosophy, the yin and yang of construction and destruction are held in perfect harmony. Chen Qiulin loves to play with opposites existing simultaneously. Traditional Chinese opera characters in colorful garb roam the mounds of brown mud and rock along the riverbanks, an angel treads the recent ruins, and everywhere the new is clashing with the old. Above all, her videos, made from 2002 when her hometown was being destroyed to 2007 when her new home was settled, provide a privileged view into the street life of the various towns. Although she is trying to push the narrative in an artistic or metaphoric manner, viewers benefit most, I think, from seeing the documentary-like footage of labyrinthine stairwells, moss-covered stone walls, kites, hanging laundry, street vendors and, of course, the river. This is the resettled city as the Chinese see it. The fourth artist, Zhuang Hui, ponders the dam project using a so-called conceptual method. He tries hard to push an objective or non-emotional stance by making use of maps and black-and-white photography to document his project. The outcome, though, is wholly emotional—to the work’s benefit. Zhuang Hui visited several sites along the Yangtze River that he knew would soon be under water from the new reservoir. In what was perhaps the last instance of human mark-making upon these pieces of land, Zhuang Hui punched holes in the dirt using a tomb raider’s stick. With such a stick, a thief could plunge through the topsoil and see if the ground responded with a noise, or else they could peer into it. Presumably Zhuang Hui’s tool is incidental to his kilometer-long drawing in dirt, but the metaphoric implications of the tool are too powerful to ignore. In a sense he is simultaneously digging the river’s grave and plundering its treasures. To complete the project he sent a photographer to the spots where holes were punched, and only water was found there, as the river had risen to its final height. 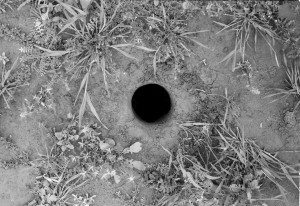 Zhuang Hui presents his work as a grid of black-and-white photographs that show the cavities he made in the earth. Their starkness is doubled given the occurrence of an unrelated project. In the late 1990s, Chinese archaeologists made an emergency dig in the Three Gorges region, realizing that once the reservoir filled in the valley, any buried objects from centuries past would be as retrievable as the sunken city of Atlantis. Several books cataloging their excavations and findings have been published, and their bounty includes ritual objects, jars and pots from ancestors’ daily lives, writing tablets, jewelry, knives—everything from societies long gone whose livelihoods depended on the river. Likewise, ancestors appear as ghosts in the world of the living in Yun-Fei Ji’s scroll paintings. Final visits are made to relatives’ graves before they, too, become doubly buried beneath the new lake. This past summer Wu Hung curated the well-received show “Portraying Food (and the Absence of It)” at Walsh Gallery, one of Chicago’s commercial galleries dedicated to representing art from the East. Like “Displacement,” here Wu Hung chose four Chinese artists in order to pair the human experience with a specifically Chinese perspective. Food, with all its attendant associations of sensuality, economics and mortality, proved to be a fun show to curate, and it was also another appeal to audiences to experience, in Wu Hung’s words, “life, emotion and struggles—the human element.” Soon Wu Hung will work with Shen Shaomin, an artist from the food show, to install public sculptures in Millennium Park, and later, he will publish a source book with the Museum of Modern Art on Chinese art and literature—all while graciously hosting the Chinese way in Chicago.